Robots are awesome, of course, but every time I get the urge to build one, I’m always stymied by my utter lack of knowledge. I’d love to be able to get a kit for an awesome robot, but they’re expensive, especially when it comes to hexapods. Most of the kits sell for about $1000, so buying one isn't an option, especially if you're a cash-strapped college student. Quick, to Kickstarter! That’s where I saw Joseph Schlesinger starting a project to make hexapod bots more affordable. 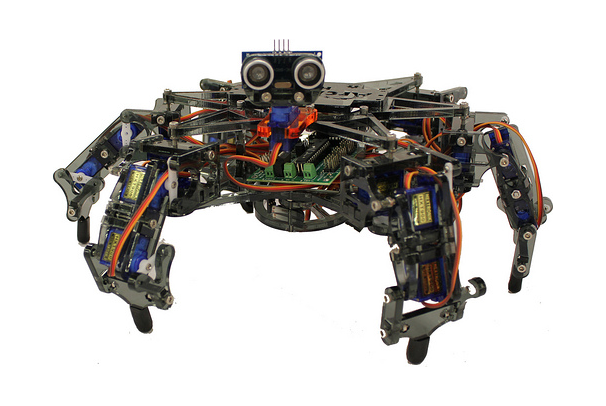 He’s asking for help to make Hexy, an inexpensive open source hexapod robot kit. He plans to include everything you need to build it in the kit, even the screwdriver. Joseph wants to sell his robot kits for $200, which is a lot less than what other kits go for. He’s already reached his pledge goal, but you can still pick up a kit by pledging, or even have him assemble it if you’re shy about electronics. The robot is easy to build, apparently, and has plenty of room for expansion. The robot uses the same screws for everything, and the kit includes extras in case you need them, so you can break out your 3D printer and start making some awesome additions like a laser vision mount, or a grappling hook. Besides, look at how cute he is with his ultrasonic distance sensor eyes. Aww.